This is the final installment in this series of discographies devoted to recorded symphonies that have been issued on CDs and LPs. The title is somewhat inaccurate as this discography does not include composers from the entire Asian continent, as composers from Russia, the former Soviet Union and Turkey are covered elsewhere. 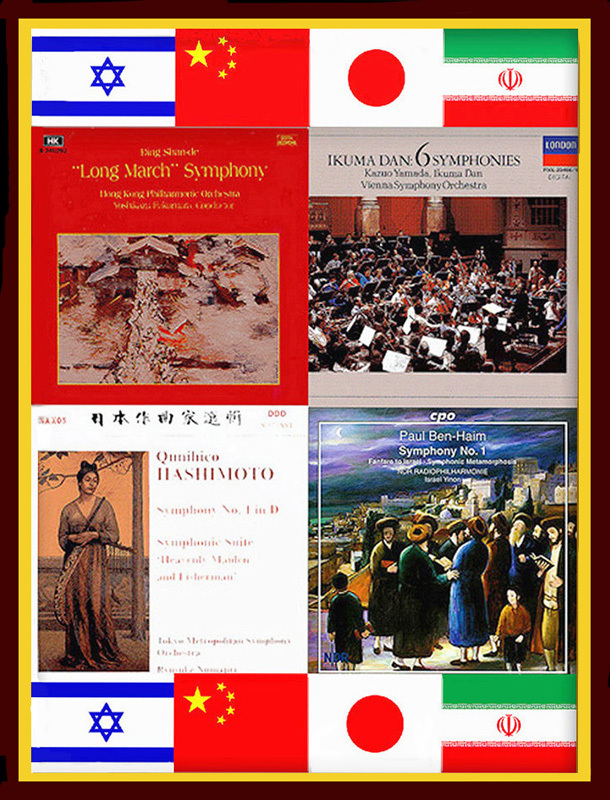 The composers who appear here are mostly from Japan, China and Israel, with a small number from other Asian countries in the Middle and Far East. As Japan has been influenced by European culture since the latter part of the 19th century, its composers began writing European style classical music in the early years of the 20th century. Israeli musical culture, on the other hand, was mostly pioneered by emigration from Central and Eastern Europe as a result of facism and war. The remaining countries whose composers are represented here are fairly recent newcomers to symphonic tradition as all had, and still have, their own versions of "classical" music. Although this discography attempts to be comprehensive, it is much smaller than any of its predecessors as it contains far fewer composers whose listed symphonies have usually been recorded only once. Recorded is here defined as being available in a physical format that can be (or could have been) purchased or obtained from either a commercial or non-commercial source. Tape recordings, DVD's, music available exclusively as downloads from the internet and formats other than CD's or LP's are not included. For the few recordingsthat have been reissued, the most current reissue and the orginal release are the ones indicated. The entry for each composer consists of two sections. First there is a compact biographical paragraph that notes some essential information such as place of birth, higher musical education (including schools and prominent teachers), subsequent musical careers, in addition to composing, and details of other symphonies that have not been recorded. Compositional styles are not discussed in these paragraphs, and readers are referred to the bibliography where various reference books that cover this subject are listed. The second part of each composer entry consists of lists of his or her symphonies that have been recorded and the various recordings of each work. "Symphony" is defined here as any work the composer has designated as such in its title, including works called "sinfonia" or "sinfonietta." The works can be for full orchestra, chamber orchestra, strings, winds, brass or chorus and orchestra. For every symphony that has them, the opus number, key signature and title are noted and the year of composition or première (if known) is stated for all. The entries of the symphonies that have had multiple recordings are listed alphabetically by the conductor's name. Each listing of a recording consists of the following components: (1) performers (in this order if all are involved - conductor, soloists, choral group, orchestra), (2) other work or works on the recording, (3) label and catalogue number and year of issue and (4) If the recording is a reissue, the original LP or CD release and its year of issue. Please note that the performers listed are for the entry work and not necessarily for the works that it is coupled with. Also, in most instances when an entry work is included in a large collection (especially if most of the other works are not related to the discography's subject), the list of couplings is not given but is replaced by the title of the collection. In addition to the thorough editorial work by Steve Ellis, I had significant help with this discography from Atsushi Sato from Japan who alerted me to Japanese composers and recordings whose existence I was totally unaware of. As in my previous discographies, Len Mullenger of MusicWeb International was on hand to help my work onto the internet. Please note that all recordings listed are CDs unless specifically designated as LPs. Composers are listed alphabetically by their surnames in the body of the text with Chinese composers showing that name first according to the usual practice. Finally, as this resource is published online it can always be a work in progress as the author has the ability to amend the work when necessary with very little difficulty. A work of this type is bound to contain errors and omissions as so much material has been gathered from so many diverse sources. Therefore, I ask anyone who reads this book and finds such errors or omissions to please let me know at the e-mail address below. I would be very grateful indeed. The New Grove Dictionary of American Music, in 4 vols., edited by H. Wiley Hitchcock and Stanley Sadie. New York: Grove, 1986. Library and Archives Canada http:www.colectionscanada.gc.